Back in college I brought a single bowl, a single plate, a single cup etc from home to eat all my food out of. I still have a vivid memory of the moment I finished cooking dinner, piled it all into my bowl and then knocked it on the floor. The bowl shattered and my food went everywhere. I was really upset that I broke that bowl. We had been through so much together! If you’re desperate, throw some super-absorbent paper towels on it, wait a few minutes, then wring them out over your mug. Those cheap soup bowls with handles from the dollar stores are a godsend. The large plastic refillable soda mugs from the convenience stores are also good if you drink lots of tea, and the 64-ounce ones can usually hold an average coffee maker’s worth of Lipton’s, or whatever you prefer. Lasts nearly all day, too. 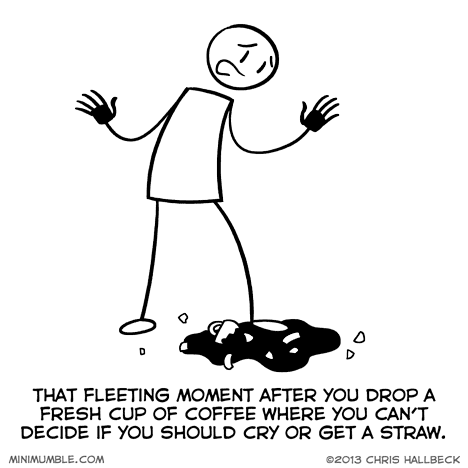 Always try the straw first — even waxy floor coffee still tastes better than tears. Tears are more of a condiment anyway. OMGosh this thread is just chock full of useful tidbits.